From an afternoon of few highlights, one positive to come from Saturday’s defeat to Montrose was the 45 minutes Scott Linton got under his belt. Linton’s recovery from injury has been taken gently, but now the versatile defender is really stepping up his comeback. 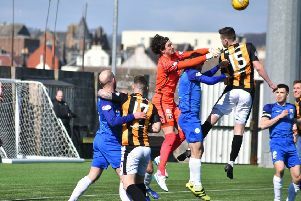 He was given the full second half at the weekend as East Fife went down 2-0 and is hoping to build further on that this weekend when the side hosts Stranraer. Linton said: “It’s been a hard few weeks. “The boys doing so well has been great but it’s meant getting minutes has been difficult. “I’ve had to keep my head down and work as hard as I can and hopefully when the chance comes along I do well to get more minutes or a start. “I’ve had to be patient and wait my time. With the exception of a spell at the beginning of the campaign, Bayview boss Darren Young has had a decent squad of players to pick from each week. The side was picking itself towards the end of the first quarter as it collected eight wins in all competitions. This too has made it tough for Linton to get much of a look in - but he admits he could have no arguments. “We’ve had no real injuries in the course of the season which has made it even harder to break in,” he said. “The boys have been flying which has been great.